Epic ALIEN Art by Till Nowak! Till Nowak is a German Digital Artist, Designer and Filmaker. In 2006 he created two amazing 3D generated images titled "Salad" and an alternative version, "Salad in the Trap". His images were made as a tribute to both H.R. Giger, and the vegetable portraits of Giuseppe Arcimboldo. 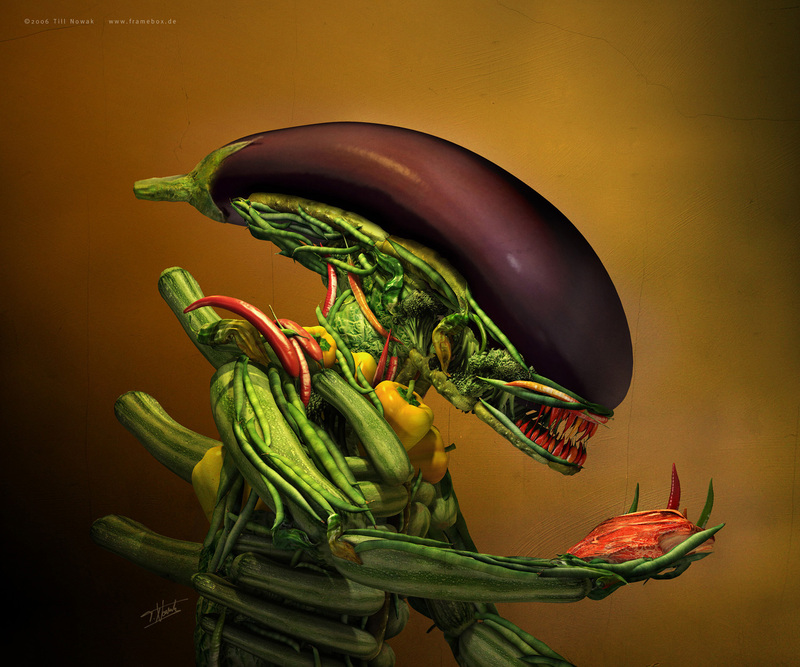 The images show an Aubergine-Headed Alien, with other body parts made from different vegetables! They combine the classical style of an oil painting with modern digital art and flip the relationship between vegetation and flesh. H.R. Gigers agent, Leslie Barany discovered them online. Both he and Giger were so impressed, it led to both friendship and multiple creative collaborations! In 2012 Tills work was presented alongside Gigers in Las Vegas, at the Giger "World of Art" Showcase. "They wrote that is was the best Alien interpretation that they had seen. Giger invited me to visit and work with him after he saw this image. We became friends and have worked together since on some animation concepts." I think the images are truly amazing and present a very clever visual paradox! They also convey how I have always felt about Gigers Alien design, which is that it appears so much more than an artistic invention.....more the product of some weird mother nature! 4 Responses to Epic ALIEN Art by Till Nowak! Tills "Salad" presented alongside H.R Gigers originals at the H.R Giger World of Art Showcase, Las Vegas, 2012. As well as his own features, Till has worked on the movie Midnight Special, and more recently Marvel Universe' upcoming movies Guardians of the Galaxy 2, Black Panther and Thor Ragnarok.